Butser Ancient Farm- Dark Skies Mag 20.5- Join today! Butser Ancient Farm - Plenty of sky. 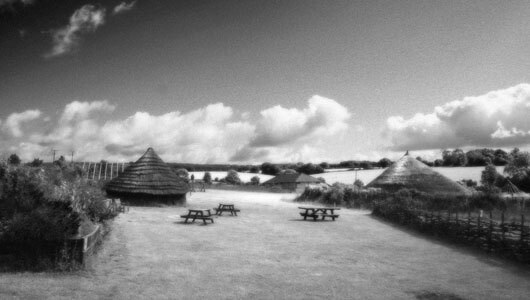 Butser Ancient Farm is a great site for Astronomy, with dark skies and a great vibe for a very decent nights observing or imaging. Plus it's shielded on three sides so offers little light pollution. We have gated access and toilet & refreshment facilities are also available on-site. It's one of the best observing places we know in Hampshire and we meet here twice a month on either a Friday, Saturday or Sunday. It's our Premium Site and with some of the darkest skies in Hampshire, astronomers come from as far afield as Wiltshire, Surrey, London, Dorset and Sussex to observe with us here. The site is a working farm as well as an open air laboratory so expect to see livestock, old replica buildings and a Roman Villa! It's a great vibe. From the North - M25 Junc10 A3 South. (39.8 miles to site from there, about 50mins) Head towards Petersfield. Past Butser Hill and QE Country Park, turn off first sliproad sign posted Clanfield/Chalton... then follow directions below. J1 A3(M) Sign posted from A3 for Clanfield/Chalton.Turn right into Charlton Lane (BAF is sign posted) and head towards to Chalton Village. Entrance is on the right 200 yard doen the hill. If it's dark when entering the track to the site - please dim headlamps (track Speed Limit 5 mph as it's a bit bumpy and throws up dust when dry). Park in Car Park – we will be observing in the area below the car park – on the other side of the buildings. Post Code PO8 OBG is for Chalton Village, so keep an eye out for the entrance to BAF!